Starting a website for your business or personal reasons can be as easy as 1-2-3. However, the moment you start craving for more traffic from different parts of the world is when things start getting tricky. 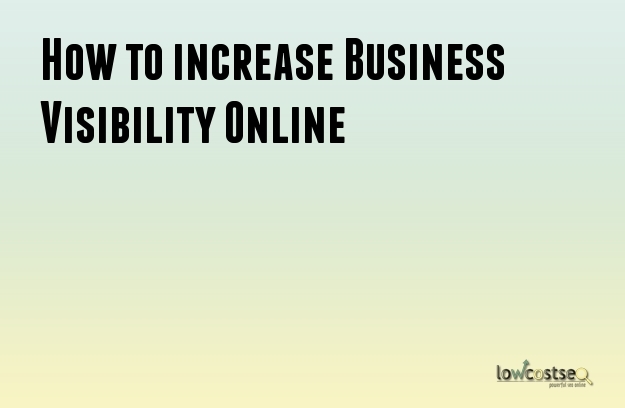 There are several ways to resort to when trying to gain more visibility with online users, particularly those who are using powerful search engines to get the results what they want. Ideally, while the results that search engines project should include your website, this is more difficult to attain than it seems. Only a number of alternatives can do this for you, and probably the best one would have to be employing the services of an SEO Company such as LowcostSEO. An SEO Company is advantageous to the market visibility of any online website in so many ways. For one, it is an inexpensive way of driving in traffic compared to ads. Clients do not need to pay SEO Companies per user’s click of their link. Although SEO optimization does not give you one-night success compared to ads, it leaves you long-lasting results, even when you no longer employ the service. Second, SEO encourages websites employing the service to constantly innovate on content. Since search engines are used every second, every single day, potential hits from SEO arrive at your website expecting new and relevant content and information. When visitors do not find the content they want, they have the power to move on to a different website in as easy as two clicks: on the Back button to the Search results page, and on the link of the competitor’s website with even more updated content. Third, many users see Google as the most reliable, credible search engine in the world. Appearing in their top results, by the theory of transitivity, make you appear to be just as reliable and credible as well. Users trust Google to give them what they need, and what they want. Utilizing SEO can help you be one of those websites at the top. Eventually, with the right content to keep users in, you too will be a website people want to go to, way beyond the time they first encountered you along with many other users. Fourth, with an SEO Company, it is easy to determine the ROI with the richness of data available after a month’s worth of optimization. SEO Companies such as LowcostSEO will provide you with the best, relevant, and not to mention interesting metrics to further motivate you to keep boosting your traffic and eventually, your returns. Certainly, it is an easy way to track down how much has been done, and what other aspects of your website can be improved on in terms of further optimization. Lastly, SEO keeps you on top, both literally and figuratively. While you are on top of the search engine results, you certainly become one of the websites at the top of each user’s mind. This just goes to show how far into the long-term the benefits of employing SEO services can reach. Definitely, investing in SEO, specifically in LowcostSEO, is a wise move, most especially if you are looking into long-term growth for your website.